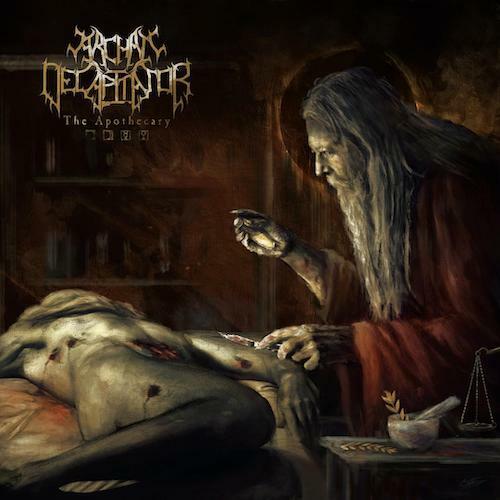 On Friday, April 19th, the Connecticut-based melodic death metal band Archaic Decapitator will release a new five-song EP entitled The Apothecary. It follows their well-received 2016 EP, Light of a Different Sun, which featured performances by session drummer extraordinaire Kevin Talley. But while Kevin Talley isn’t featured on this new EP, Archaic Decapitator have enlisted another tremendously talented skins-man in Gary Marotta from Xenosis, and new rhythm guitarist Chris Ridley has also joined the band as a permanent member. Those two round out a group that also includes vocalist Kyle Quintin (Fires in the Distance, ex-Formless), lead guitarist Yegor Savonin (Fires in the Distance), and bassist/backing-vocalist Craig Breitsprecher (Fires in the Distance, ex-Formless). Today, through a lyric video, we present a second single from the EP, “Cruelty of the Host Star“, a song that vividly reveals the dynamism of The Apothecary as the band accent their bracing rush of melodic death metal with progressive flourishes, elements of black metal and thrash, and even a few symphonic touches. The song is a high-voltage experience that manages to be both cold-blooded and almost deliriously ebullient. It delivers the savagery we expect from death metal, but it’s such an exhilarating thrill-ride that it’s bound to leave you smiling. The band combine racing, ravaging riffs and battering drumwork with start-stop rhythmic jolts and darting, dancing leads. The exultant energy of the song is enhanced by rapidly flickering keyboards and fanfare-like bursts of melody, as well as a head-swirling solo that becomes a dual-guitar extravaganza. There’s plenty of ferocious energy in the vocals, too, with a vicious array of savage snarls, scalding shrieks, and guttural roars assaulting the ears. The EP is recommended for fans of such groups as Dark Tranquillity, Dimension Zero, Hypocrisy, Naglfar, Kalmah, Insomnium, Old Man’s Child, and The Black Dahlia Murder. The striking cover art was created by Caelen Stokkermans, who handled the imagery found throughout Misery Index‘s 2019 lyric video for “The Choir Invisible“, as well as last year’s Soreption album cover art. The Apothecary is available for pre-order now, via the link below, and after that we’ll give you the track list, our premiere of “Cruelty of the Host Star“, and a stream of the EP’s first single, “Skyward“. Enjoy!